Look around CES 2010 and you’ll see acres of HDTVs and Blu-ray playes, all showing off their flashy Internet TV features. 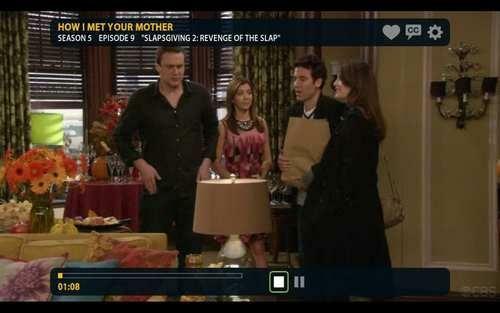 YouTube, Flickr, Facebook, Twitter and a billion other social media apps, all viewable on a shiny new $5,000 HDTV. But what if you don’t have $5,000? Or worse, what if you just spent $5,000 on a shiny new HDTV that isn’t Internet-enabled? Step forward Boxee and D-Link, who together have been showing off the Boxee Box. If you want to expand the features of your HDTV, open it up to a world of rich new (and free!) Web-based content, view your pictures and videos as well as those of your mates, or listen to your music or Internet radio, then read on: the Boxee Box does it all, remarkably simply, and for an unusually low price. 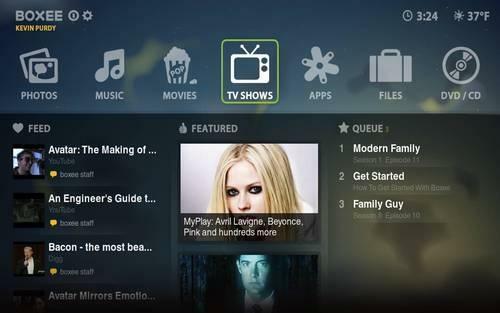 Boxee began life as one of those cracking apps that lets you stream your movies, videos, etc., from your PC to your TV. Originally just a software application, it’s been doing this a few years now, but the problem has always been that it was a little too teccie. Although Boxee provide a few clues as to how you can hook your PC up to a TV, the info provided is a little vague! Basically, it boils down to installing the Boxee software on your laptop, then hooking your laptop into your TV via an HDMI, DVI or VGA cable. The problem here is that you need to tether your laptop to your TV and yourself to your couch. If you want anything more fancy (wireless, perhaps?! ), you’re pretty much on your own. There are dozens of different solutions, but finding the best option (and the best trade off between ease of use, price and picture quality) is a nightmare. Fortunately, Boxee realised this, so they’ve come up with a solution: the Boxee Box, or everythng you need to get Boxee working on your TV with absolute simplicity. The Boxee Box is a Set Top Box developed by D-Link that contains everything needed to start using Boxee on any HDTV straight away. As you can see, it’s a somewhat unconventional looking box, and I guess its shape will make you love it or loathe it. 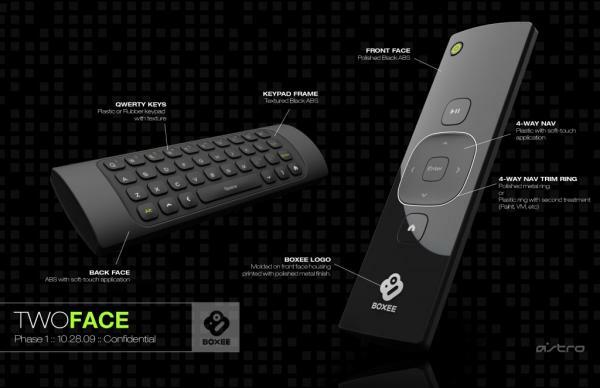 The Boxee Box has some serious hardware inside to give you the richest experience possible on your shiny HDTV. Inside is an NVIDIA Tegra2 chip powering the cracking user interface. Based on a dual-core ARM Coretx A9 CPU (i.e. very very fast! ), there’s more power in the Boxee Box than in most laptops. Tegra2 has enough grunt to play 1080p HD content pulled from either your PC or the Internet (it supports Adobe Flash 10.1) without even breaking sweat. 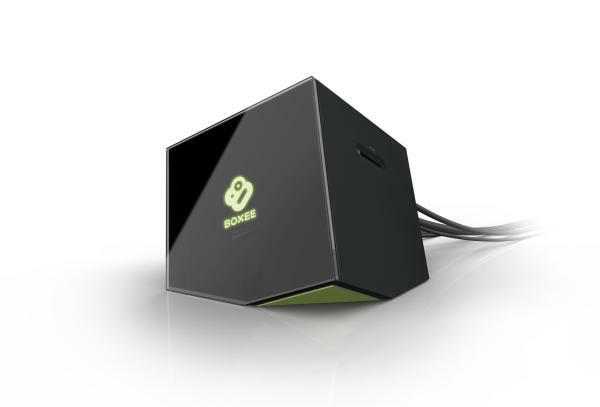 The Boxee Box is also unusual in that it doesn’t use InfraRed for its remote – it uses RF, which means it doesn’t require line of sight, and can work in any room in the house. Add to that an 802.11n WiFi chip and you’ve got a full powered media streamer that’s guaranteed to work flawlessly with 1080p HD content pulled in from anywhere. 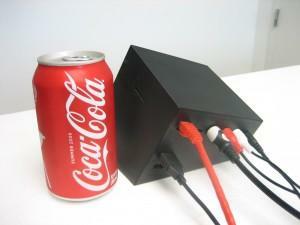 How do you connect your PC to your TV? By wire or wireless? If it’s wire, do you use HDMI, DVI, Video-S, VGA or (more rarely) Ethernet? Do you connect directly to the TV, or to a Set Top Box such as a media streamer? If it’s wireless, what type do you use? WiFi via a media streamer, or wireless HDMI, streaming the video from your PC via a transmitting dongle straight to your TV, which also needs a receiving dongle? There are many other options you could also try, but each comes with its own trade-off between price, quality and usability. How do you know what’s going to suit you until you’ve actually tried the different options? Unfortunately, that’s an expensive strategy! The Boxee Box solves these problems for you at a stroke. It uses WiFi and connects to your HDTV using a standard HDMI cable (the same as you’d use to connect your DVD player to the TV). That’s it! Turn your PC, your TV and the Boxee Box on, and start using it straight away. Streaming media from PC to TV has always been fraught with quality issues. If it’s a wireless link you’re using, it needs to be robust enough not to keep dropping all the time, and fast enough to ensure a smoothly flowing picture without jitter. The Boxee Box uses fast 802.11n WiFi for super-smooth Hi-Def video streaming, and D-Link have ensured the WiFi signal won’t miss a beat thanks ot the high quality 802.11n WiFi chip by Broadcom. This is the advantage of Boxee teaming up with D-Link. Boxee tell D-Link exactly what their software needs for optimal operation and ease of use; D-Link have the hardware chops to develop it. 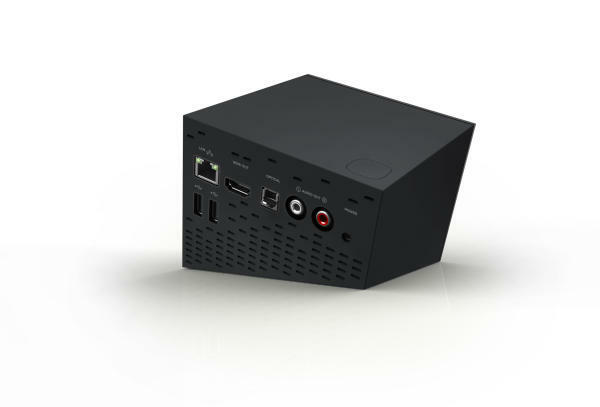 The result – a box that’s been optimized for the quality demanded by Boxee, and ultimately by you. Another problem with getting the Web onto your TV: YouTube videos, Web sites, Twitter feeds, Facebook status updates, etc., all require text entry. If you’ve ever used a TV remote to enter text, you’ll know it’s the most frustratingly hideous thing you’ll ever do. Hunting and pecking for characters on the screen using the remote’s up, down, left and right buttons is ludicrously bad; in fact, it’s so bad, you’ll only ever do it once and then give up in a fit of exasperation! All that content in the world, and not of it available because you can’t enter any text. 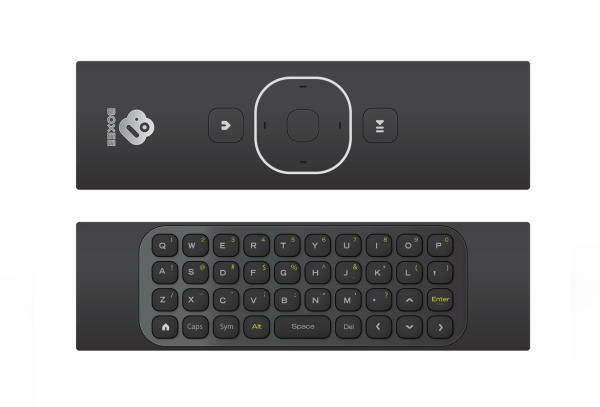 Boxee’s answer is to kit their remote out with a full QWERTY keyboard. It’s a normal remote control on one side, but flip it over, and you’ve got a physical keyboard for entering text. Obvious really! It also uses RF rather than infra-red, and so can be used anywhere in the house – you don’t need line of sight for it to work. You can therefore control your music, skip tracks, rewind, etc., from any room in the house. The final problem with media streaming applications and media receivers has been their awful user interfaces. Because most of the R&D has focused on the hardware (i.e. the tricky part of actually getting the video on the PC to stream to the TV), not much thought ever went in to how the user would actually use the product. The result was usually the user interface from hell! Boxee, in contrast, has designed the user interface first, around the user, and then tasked D-Link with the problem of building the hardware to support it. The result is a beautiful user interface that looks superb, is genuinely intuitive, and has features that even dedicated Internet-TVs can’t replicate. Boxee itself – the ultimate social media app for your TV! 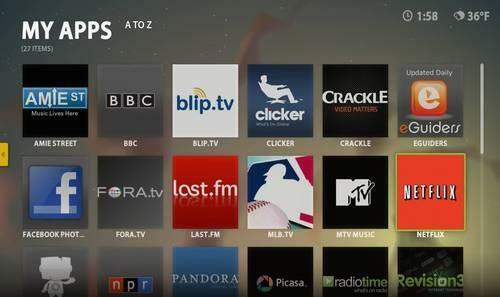 Here’s a video of the Boxee interface showing some of its features. You can see for yourself how great the interface looks. 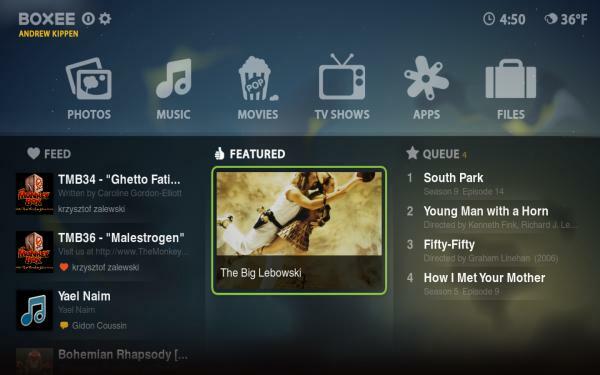 Now check out more of exactly what Boxee can do for you. Feeds – the latest feeds from your friends’ social networks. Plus what they’re watching and what they’re listening to. Queue – a list of movies, videos and TV programmes that you’ve found that you want to watch later. This is your playlist of things you want to watch. That’s the homescreen. The best bit, though, is finding content you want to view. 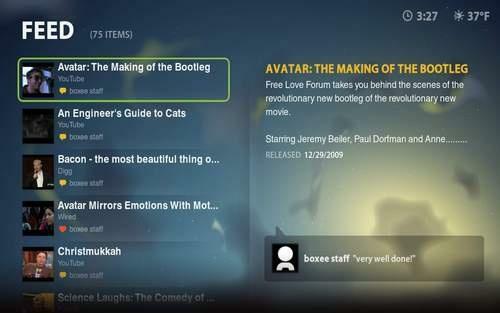 Boxee contains content from pretty much everywhere. In fact, it’d be easier to list the places it doesn’t get content from, but because that wouldn’t be particularly useful, here’s a list of some of the key places it does! 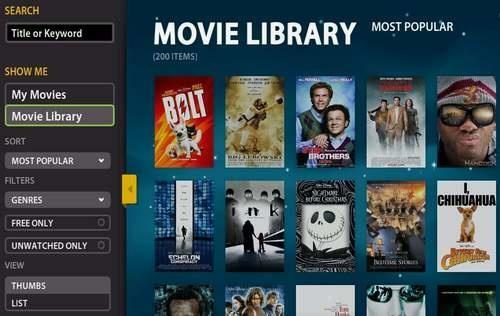 Boxee is a media streaming application, and so is designed to pull your pics from your PC. It’ll scan your PC to find any pics or videos there, and will then display them in its own beautiful user interface. You can view the pics picture by picture, or watch them as a slide-show, zoom in or out or rotate them. Videos, too, can be played back and controlled just as easily, as can TV programmes or movies that you’ve downloaded, and any music that you’ve got on your PC. Just imagine: you’re sat on your couch, viewing your videos, your pictures, and listening to your tunes on you HD home entertainment system, even browsing the Web, while the PC that’s storing all this content is tucked safely away in your study upstairs. And if you’ve got the ultimate home entertainment setup with full surround sound, Boxee will let you pump your tunes effortlessly from your PC to your home entertainment’s amp and speakers, so you can hear your tunes how they should be heard – loudly! Perhaps the best part of Boxee, though, is the way it integrates with the Web. You can select from hundreds of apps that connect to different Web sites, letting you pull in content from virtually anywhere. You can link to your Flickr or Picasa account, for example, and view the pics you or your friends have taken, or just browse pics from other people. Connect to YouTube and view your own videos or any videos for that matter. There’s even a Boxee Bookmarklet that lets you add any video you see on a Web site to your Boxee Queue with a single click, making it ready for you to view when you get home from work, for example. Remember, all this is taking gplace on your beautiful HDTV. Boxee doesn’t just download content, though – it lets you share what you’re watching with your friends. Add your user details, and it’ll automatically share what you’re watching via Twitter or Facebook. Probably best not to share everything you’re watching, though (particularly if you’re an MP! ), as some of the apps you can download are a little, shall we say, risque! Don’t worry, though, you can set parental controls to prevent adult apps from being viewed. Boxee is a brilliant way to view all the content that you’ve collected over the years, and the Boxee Box is the perfect compliment to an already excellent application. If you’ve been wanting to get a media streamer for some time now, but have been put off by the complexities, quality, poor user interface or even the price, then the Boxee Box is the perfect solution. Download Boxee onto your PC or Mac to try it out – it’s completely free – and see for yourself how good the user interface looks, and how easy it makes viewing pictures and videos form across your PC and the Web. Now picture all of that content running wirelessly on your HDTV, the sound coming out of your surround sound speakers, all controllable from a QWERTY-equipped remote whereever you are in the house. And all that for less than $200 (UK price to be confirmed). Perfect! The Boxee Box is already on my gadget wishlist – how about yours? All I can say is: *drool* !